I was sitting out by the pool yesterday, working my way through a novel so trashy and horrible that I'm ashamed to tell you what it was---really, being unemployed in a tropical country is TERRIBLY taxing, now if I could just get Sean to polish each gummy bear to a high sheen before I put it in my mouth---when a couple of little Singaporean boys started splashing around in the shallow end next to me, forcing me to listen in on their conversation, which was mostly centered around weiners, farts, and which teacher they might get when school started again next month. Presently, a third one approached the edge of the pool eagerly, and they looked up at him slowly with that scathing detachedness that only bored eight year olds and Paris Hilton are able to muster. "Hey, guess what? I got new Crocs!" called the newcomer, excitedly. "Oh," said one of the boys in the pool, casting his eyes over the newcomer's shoes with one eyebrow raised. "They're red." "Hmmmmmm," said the second boy disapprovingly, wrinkling his nose like a miniature Stacy London. "You know, Martin Fong has red ones." The newcomer's face fell. To have the same shoes as an elementary school pariah like Martin Fong, apparently, was a fate worse than death. "Well, I was going to get them in green," he said. "But then---"
"Ew." said the first boy dismissively. "Green?" "Actually," said the second boy, suddenly perking up. "You know what? I just remembered something. Franklin Ho has red ones, and he's cool." "Really?" said the newcomer, all smiles again, his world suddenly righted by being---sartorially, at least---on a par with the mysterious Franklin Ho, likely the Fonz of the third grade. "Does he? Really? Franklin Ho has red ones?" "Yeah, well, maybe," said the first boy, shrugging nonchalantly. "Whatever. You still should have got the black ones. Like me." Did you know this? Did you know that there was a Hierarchy of Coolness based on the color of your Crocs? Isn't it enough that they're all entirely hideous and that everyone on this tiny island seems to have become suddenly and violently obsessed with them, meaning that you can buy them on every street corner, in fact, so out of control is the madness that I could well have bought a pair AT THE OPTICIAN'S yesterday? Isn't that enough? It used to be that people said "don't get caned!" when you went to Singapore, and then they said "don't get SARS!" 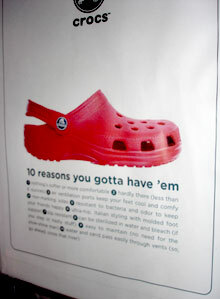 These days, you can probably hear the cries of "don't get Crocs! Oh please, please, no matter how good the exchange rate is, just don't get Crocs!" from the departure lounge. Followed, most likely, by "and especially don't get red ones! Don't you know? MARTIN FONG HAS RED ONES." OMG! You're hilarious "polish each gummy bear to a high sheen before I put it in my mouth" and I DESPISE crocs! Whoever decided that they were appropriate anywhere outside of a muddy garden should be put in the stocks!! I love reading about your International Adventures, and desperately want to Join You (I'm an excellent housekeeper, and my hubby can Fix Stuff)!! Jon Armstrong has black ones. And when he -- and a small boy in a swimming pool -- start a trend, there's no stopping the madness. And if you have red ones, you might as well just get a matching crimson "A" on your chest as well. Especially since Martin Fong couldn't do a Blue Angel in the courtyard last month, even though Franklin said he's always super-farty. Ew! this is too funny...nothing like being a fashion don't to knock you right off the cool list! What is with the world-wide spread of Croc madness? 2 hours ago, I was at the mall in Hyannis, MA, USA and passed a mall-cart loaded with every shade and size of fake Crocs you have ever seen. It is truly viral, this Croc thing. Ugh - I hate those shoes. So ugly! WHY ARE THEY A FAD?!? And wouldn't your feet sweat in them? Blech. I am mocked incessantly in our house for my love of the Birkenstock and I was told in no uncertain terms that if I brought home a pair of Crocs that they would be thrown out post haste. "Never fear" was my response as I remembered the feet melting experiences of my youth and did not want a repeat of that. No Crocs at our house EVER! Besides, who wants to own the same shoe as Martin Fong! I got Crocs when they first hit the health food stores about 4 years ago (when they began) and wore them gardening (that was what they were for)...so I wore them in the garden and suddenly everyone in the last year or so started wearing them to church and so forth, so I have ventured out to wear them when I take out the trash and if it is dusk, to the beach, but that is it. I admit, my kids have them but only because my sister knows the owner, the guy who created/started them, and got them and mailed them to me. Today, I was at a birthday party for 5 year olds, there were about 25 kids there, and I would say 80 percent of them had Crocs....ARAAAUGH!!!!! They are cute but it reminds me why I dont shop at the Gap anymore. OK, they're ugly, but the children? CAN PUT THEM ON BY THEMSELVES! Even the two year old! And that just gets us out of the house a gazillion times faster. My little girl has the red ones. I won't tell her about Martin Fong :). And I used to call jelly shoes "blister shoes" because honestly, did anyone ever wear them without ending up with a feet full of angry red welts? Ah, the 80s! I must admit I own those ugly shoes (and I use the term shoes loosely). I bought them a couple years ago for gardening purposes only. Mine are yellow; however, my husband has the dreaded red ones. We don't wear them in public. We wear them in the garden so that we don't ruin our better sandals when the children "help" us water the plants. Yes, they do make your feet sweat but that's okay because you're holding on to a hose! I am just wondering if Martin Fong will ever Google himself (a la Richard Cramp) and perhaps gain some elementary school respect, due to the mention in NBB. Hey--you may have just altered one kid's lowly status, even if he does have Crocs. Red ones, at that. What was the name of the book?!? Uh oh, poor little boy in my Summer Camp class - he had the red ones on this morning. I will make sure to send a note home on Monday warning his mother that they should not go to Singapore lest he be compared to the dreaded MARTIN FONG! Also, Mr. Dooce - aka Jon should go become King of the Crocs at that pool. Sheila, this is horrifying, but it was "Lipstick Jungle" by Candace Bushnell. I KNOW! I had to wash my hands after typing that. At least he didn't get YELLOW! Arthur Ling has THOSE!! Sadly, Crocs have played a huge part of my life in the last four weeks, and if they start showing up in national magazines, it's my fault. Lipstick Jungle was not nearly as good as Trading Up. Excellent use of that famous but yet usually poorly done (by others) writing technique where you bring up a previously nearly insignificant funny bit and make it the grand "Ta-Dahhhh" humorous exit line of the piece. So nobody's commented on the punny title yet? The boys of Singapore dying to get into the right coloured Crocs? I have to laugh like hell at "Youth in Asia" because when I was a kid, that is exactly what I thought they were saying when I heard "euthanasia" on the TV news, and I couldn't figure out for the life of me why people were making such a business of youth in Asia. "What is controversial about a bunch of Chinese kids?" I used to think. I had never heard of these heinous products before reading this post. Obviously they have not yet permeated London to the same extent as other destinations. I just looked at the Crocs website, and thus I proclaim the 'Islander' style (an awful fusion of Jellies and deck shoes) to be an abomination... against God AND nature. I saw a man wearing a PINK pair of Crocs last weekend. IN PUBLIC! Eeeee! i thought vrocs were supposed to be comfortable. No one has even mentioned it. I see nurses wear them as if they were the only shoe supported by the ANA. So what's the real deal? When I worked as a shopping concierge, I had to track down a distributor for kipling. Apparently it was very popular in mexico, and the word on the street was you could buy it or "someone" knew where to find them. Yep, I own a brown pair. When the puppy rings the "I've got to go right now bell" attached to the back door, there's nothing faster to slip into and get the train moving. Sure Crocs are a fad but they are much more practical a fad than Wasabi Peas. i will come here again! hey vids provides information about car hire, how to rent an exotic car, luxury cars, BMW cars, Porsche cars, Ferrari cars, Maybach cars, car videos, sports cars, limousines, car financing, prestige cars, Bentley cars and tips about chauffeur driven cars.